Have date this weekend? or a party to attend? 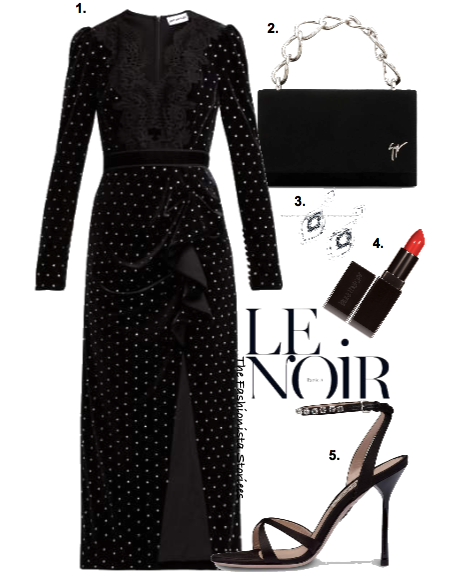 Make a sparkly entrance with inspiration from this Black Friday Style look. 1. SELF-PORTRAIT crystal-embellished velvet dress, available at MATCHES FASHION. 2. GIUSPPE ZANOTTI 'Lucretia' velvet chain strap bag, available at ORCHARD MILE. 3. JC PENNY diamond accent & black diamond sterling silver drop earrings, available at JC PENNY. 4. LAURA MERCIER creme smooth lip color, available at BERGDORF GOODMAN. 5. MIU MIU crystal embellished satin sandals, available at FARFETCH.